OS grid reference: NY9361 6582. 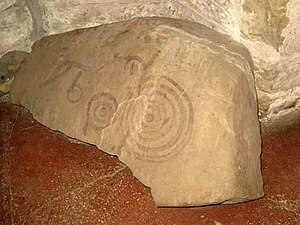 The Oakwood Stone is a prehistoric lump of stone that has cup-and-ring markings. It can be found inside the church of St John in the hamlet of St John Lee at Acomb on the north side of the A69, 1 mile north of Hexham. It is a stone of great antiquity that dates back to the Neolithic Age some 2,000-4,000 years BC, and what a very nice bit of rock-art it is. Also, the early 19th century church houses a Roman altar. The present day church is dedicated to St John of Beverley, a hermit who became bishop of Hexham and, later York, and stands on the site of several previous churches – the first was built back in the 10th century AD. St John founded a Saxon monastery on the site of the church in the late 7th century AD. The ruins of St John’s hermitage and oratory stand at the bank of the church. The 1 foot high lump of stone just inside the baptistry door is curved at the top and rounded at the edges, but the bottom part is obviously broken away and missing, so could there have been a few more cup-and-ring carvings? It was accidently ploughed-up from a field beside a clump of trees at Oakwood farm on the Oakwood road just north of St John Lee. Historians believe that it once formed part of a capstone or grave cover from a burial cairn (cist) that stood on a ridge of land; there are other ancient mounds and cairns in the same area. There are five cup-and-ring carvings, four of these are small, but the fifth is much larger and has five concentric rings. 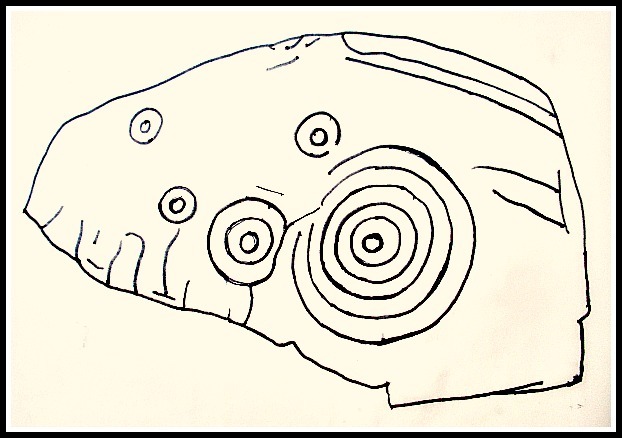 It is thought to date from the Neolithic period or the beginning of the Bronze-Age, perhaps? So that could make the stone upto 6,000 years old. Also in the church at the right-hand side of the baptistry door there is a Roman altar stone that has been used as a font for Christian baptisms. The altar may have come from a Roman fort beside Hadrians Wall, a few miles to the north. Categories: Cup-And-Ring Markings, The Oakwood Stone Northumbria | Tags: The Oakwood Stone at St John Lee in Northumbria | Permalink.